BURiEAU OF I'I.ANT I NIDlSTIY-rcirilar No. 16. B. T. G.ALILOWAY, ('hif .if Bureaiiu. Ex lq.I/T IN ('IIA1I.KJ OF 1'1ECIAL. AIR.LEI, 1 \VI ;TI(;\'I()NS. l'lhic iolgist a nil I'holhgis.t, and I. f Biurcuc, Bieverly TI. iGalloway. 'hl /ciolo/ilst al Im'alheologist, ad Assi.stant C hif nf Bureau. A',1wrt F. Woo(ods. labloratory lqf I'la I'tltihology., Erwin F. Smilh. 'aiholoList ill Charge. Ilnrrsligaliuiis o Diseascs of l'ruits. Morton V Waite, P'athologist in Charge. Lilboratory (ii li'resti I'atholtogy, Iavy n Metcalf, Pathologistl in C'hargo. Cwotli anind Tiruictk Diast. s and PhlItt Disas Suiirety, \\'illian A. Orloni, 'alhologisi ill ('Charge. P'ictc l Ic li lctlri! I lmstiqi ionsii, W a\\ lt'r T. Swingle'. : I ..' i, in Ciharge. C('illin ccrliiiln e clti/ici, A rliil.ialdl I). Shanlel and Daniiel N. Shhoeialker, hysiologisls in Charge. Crnc Ii ,ei atico/c s, Charles 1'. llarlly ,. l 'hY soloo isi t in Charge. Bioicmiic lin stictica idIcs if T ropical find Subtropical I'lan/s. Oral or F. Cook. Biooinist in Chargt. t'hy.icail l.ortlitory. Iyman 1. BIriggs. Physicist in Charge. C'rop ) i clchi/deiqy ani Fiber Ilccnt Intestigations. Nathan A\. CobbI Crop Techinologil icn Charge. /Icmil tci anc d laifii/ liii eiiatioinis, Frederick V'. ('Coville, Bolaist in ('Charge. Farm nayiitmiiitc il Intsligations, Williami J. Spillniani. Agri'culturist in Charge. Grciin l ctilica/tlii.u Mark Alfred C('arlon. ('e'realisl in Charge. Arlington c l.rprcrimental Farmi, l'c C. Corbell t, I Iorticulturist in Charge. I'cqetabc Tist cig Gardens, William W. T'raiy, sr., Snperincnideiit. Sugar-Pie liistitations. Charles 0. Tow nscnd, I'ahlliogist in Charge. Dry-Liand A agriculture Imstigatlios. Ei Charming (Chilcotl. Agricullurist in Charge. I'liml/iccl ('ll Cc lions, c e GIstavus i1. Brackett. I'oceologisl in ('Chargc. l'iild l]cniyctigalcic.t i c I'oimoloy, William .. Taylor and (;. Harold PIowill. lI'ioimlogislts ill Charg. 1'jierimn al (Giardins and (;rouinds. Ehdward M. Biyr rnics, Suirintciienlen. l'orrign scc I ad ri lant Inroduclioni David Fairchild. Agricultural Explorer in C'harg.
! ''riia" "'rpi islcigationsi, ('Cliarh's V. l1'iper, Agrostologist in ('Charge. S/ld iLeboractory, Edgar Brown. lBotanist in ('Charge. Grain Scland,:ri:,diiiatin lohn 1). S, h iahan, Ccrop T'<'lnologisl ill ('Charge. Sniiropiical L.ahlralry aild Giardetn, Mtiami. Fla.. 1'. .1. We'stcr, Gzardlcnr ic C'harre. Snutlih T" l s (Ic a'dcic lcro I nscilh, 7'I'c.. Edward C. (r'en. I'c nologit in Charge. Farersl'( C cc ijetrcitcc I) c ciciat clrctlctci ltio e 11 aSc caic c A. Knacpp. Spcial A r'e 'cnt ill C'argec*. Chief CIck, .Janms E. Jones. AM) IMIlROV N 'lI ..
factors -r (uialilhs in barley il is especially desirable to improve. 4 A NEW'V BASIS FOR BARLEY VALUATION AND IMI'T',\'l.MI1:NT. thiat take place during its successive steps in mnalting. anioilunce a Inew basis for ibarilev valuation. (endospeirii, which fliorms lil he bulk ) of tile grain and when g(erilinat i ii. before tlie scut(eluiiii c()i tl absorb lIlis supply and convey it to the plant.
"" [4l'i i rs;il 1tiHicii 1rc of W heaM . i puiortilit a t f Inct ionis. Ipodukt of t lie .hsc UlHni anid n1cn sevrdete *v itn oute1 la\ w e!'. KA le (At lie"
(ins process. The l c'uti lluiltll ii can lilu'w o lbe called lie the nalli! i,,- thle AMoo valhew. mlu it in- vnlu and gil riiimit il ii, vzi h ofill 1' arloy. with th til in figure 2: alo o t(le t\\,w seln lluiiis. 6 A N ENW BASIS FORl BAILEY VALUATION AND IMPROVEMENT. will be greater without any loss in the capacity of each cell. structural differences of tile scltelluin. 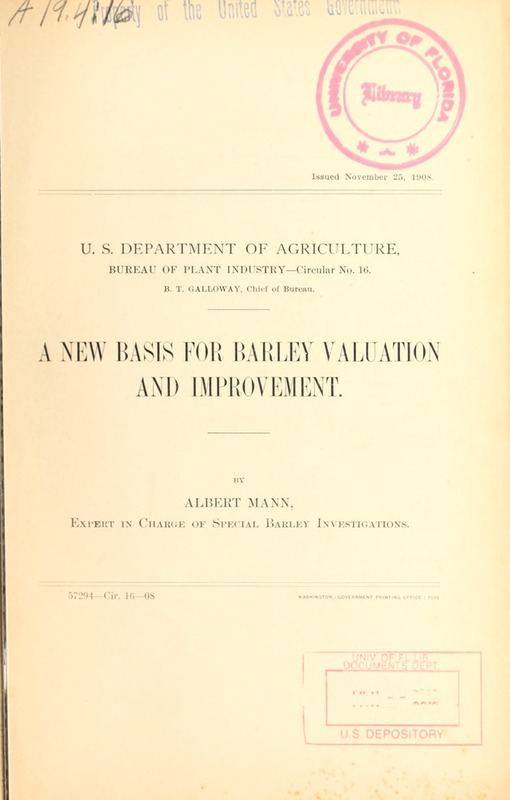 -- B A NIF:W BASIS FOR BARLEY VALUATION AND IMI'I \ M II- xT. sIhal ctiecure results of dist imct 'v alue to American arir'i ilture. \XsXA1 x WI'INi 1). (C. 'I~tpht/: r 2,, 19t'i.